Kitchen blinds are a great idea. They won’t get in the way like curtains would and they’re easy to keep clean. But depending on where your windows are and your personal taste, you have a few decisions to make. We’ll take you through some ways that will help you choose the perfect blinds for your kitchen. Remember to think practically when you’re choosing kitchen blinds. If your windows are over a sink, you’ll need to make sure you don’t get blinds that are too heavy for you to lift to open and close the window. If you have windows near a hob or sink, it might be a good idea to go for a PVC blind in either vertical, roller or Venetian. They are easy to wipe clean and they won’t go mouldy due to the steam in your kitchen. If you’ve got a kitchen/diner, roller or vertical blinds can look quite clinical and not very inviting. Instead, you might want to try Roman blinds. The folds of fabric create a warmer look that will make your dining area look more homely. You can buy Roman blinds in so many different colours and patterns that whatever the decor of your room, you’ll find something to suit you. Whatever style of kitchen blinds you go for, don’t forget to inject a bit of yourself into them. Choose a colour and/or pattern that reflects your personality as well as your kitchen’s decor. 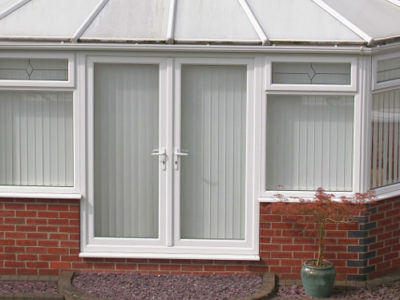 Have you got patio doors? If you have patio doors in your kitchen, the chances are that they’re going to be opened at least once a day. Most types of blinds will make it difficult to open and close the patio doors, so you might want to consider perfect fit blinds or vertical blinds. If you need help choosing and installing blinds, use our service to find up to 4 blinds companies who will be able to give you a quote.